AOR's Pro Cogni Co-factors is an ideal formulation for the prevention and management of multiple pharmaceutically induced deficiencies, simultaneously providing the necessary co-factors for neurotransmitter synthesis and ATP production. 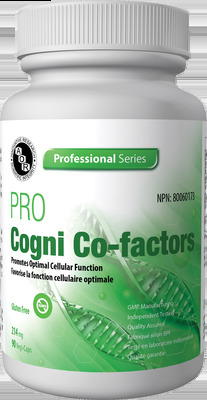 Pro Cogni Co-factors also contains the active and bioavailable forms of vitamins B3, B6, B12, and folate, and minerals magnesium and zinc. This formula provides a synergistic combination of nutrients for use in mood disorders, PMS, mental, gastrointestinal and respiratory conditions and kidney stones. Those on a number of pharmaceutical drugs and concerned about nutrient depletion or side effects may benefit. Other individuals that may also benefit from this combination of nutrients include: the elderly, those with chronic diseases, autoimmune conditions, and vegan/vegetarians. This formula provides active forms to reduce the burden on already overworked bodies. Pro Cogni Co-factors is a unique formula designed to prevent and/or mitigate some of the adverse health outcomes associated with polypharmacy. This formula is ideal for tailored, personalized treatment and variable dosing with synergistic amino acid supplementation. It is also safe with concomitant pharmaceutical use. Adult Dosage: Take 3 capsules per day with food. Cautions: Take a few hours before or after taking other medications.